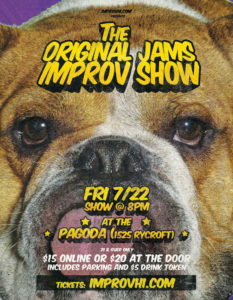 Join us for some live improv comedy at the Pagoda Hotel! Featuring some of Hawaii’s top improv players and special guests! $10 student tickets will be sold 10 minutes before the show starts depending on availability. Watch a hilarious comedy “test kitchen” where local comics, writers, and artists try out their original sketches. Also featuring live music and improv comedy! *Live sketch and videos are due no later than Monday, September 26th.